Please forgive the delay in announcing a winner. At this stage the team has a winning design in mind, but we need to wait until Friday morning to get our pastor to sign off his approval on it. The official result will be announced (and the prize awarded) on Friday. Thank you for your patience. Very good then. Just hope my entries at least got looked at though as I see no star next to my entries nor received any feedback, Thanks in advance for a review. #81 #82 #83 . The competition is about to close. Thank you for all your hard work, everyone. There are some very innovative and clever ideas on this page, and it's been great to see how well each of you has worked with feedback to refine your graphics into line with our aims. Once the competition closes, my team will discuss all the entries and select a winner. Please give us 48 hours to make our final decision. This contest is guaranteed, so someone will be taking the prize, even if it takes us a couple of days to announce. Please be patient. I will be meeting with our church pastor in 13 hours from now. He will have the final decision on which design wins. I will be taking all entries so far for him to review, so if you have another idea you'd like to be rated before the contest closes, try and get it up here in the next 12 hours. I will be printing all the ideas that have 3 stars or more, plus any new ones submitted between now and then. Please review #81 #82 and #83 please and my clarification of them above. Thank you and God bless. A little clarification on my symbols on #81 #82 & #83 The smaller blue "heads" represent people too such as in the Discipleship, the blue head is receiving an anointing to go forth and minister. Mr. Lloyd, I just submitted #81 , #82 , & #83 . I made it days ago in Microsoft Power Point and was trying to convert it to .AI format until my Adobe illustrator crashed. (But it can be converted) It is better in Power Point if you have it as you can easily move around the tiles, and change the angles from diagonal as it is now to straight up and down, change colors easy too if I submit it to you in .pptx form and you have Power Point 2003 or greater. Each tile is a separate symbol and can be separated apart easily, just click and drag. Hope I am not late. Please let me know what you think. Perfect colour scheme (except for the middle - would it work as a black image on white background in the middle? ), clear icons, meaningful layout. Excellent work. I don't really think the "worship" icon is right - it doesn't show the meaning we are looking for. 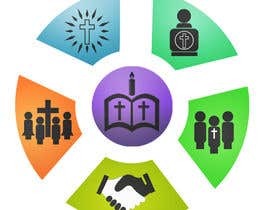 The discipleship icon is ok, but some of the other concepts that have been submitted are more what we have in mind. Sorry everyone - a correction. I've just reviewed my earlier post, and it has a typing mistake. I meant to say that the pastor likes the style of icons in #34 . The part about liking the layout of #20 is correct. 1. Keep the icons clear and uncluttered. 2. There does NOT need to be a cross in every image. Most of the crosses are making the icons appear too detailed, and are not adding to core themes. He is a big fan of the layout of #20, and likes the style of the icons in #54. He is very impressed with all of your talents. #61 and #62 please. Thank you. Please review #41 Thank you. I like the concepts of the icons - the green, blue and orange ones are particularly clear in their meaning. The only concern I have is that the figures have all been lifted from common street signs, and that fact is quite noticeable, particularly in the purple image. 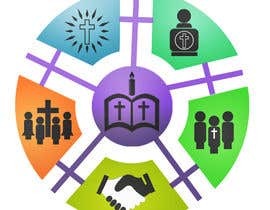 Also, if you are using a cross in all of the surrounding images, I don't think there needs to be one in the central circle. It is clear that you've read all of the information in the brief and my feedback to the various designers. This attention to detail is pleasing. I have submitted #52 , #51 and #50. I have changed the discipleship, Ministry and Evangelism & Mission. Try to make them clean simple and easy to understand. Please have a look and give me your feed back. Thank you! I have submitted on 32 33 and 34. Have a look and please give me your feed back. Thank you for your entry. Your icons are clean and clear, although I find it odd that all of them show people with their arms up. Although the depiction of a guitar player is an accurate understanding of one part of how we act in ministry, I would prefer not to show this as a musical image because of how these graphics will be used. Also, I like the reflective effect on your circles, but the colours are not friendly. I have given your design 3 stars because of the style of your icons, the clarity of the images overall, and the worship and fellowship icons. 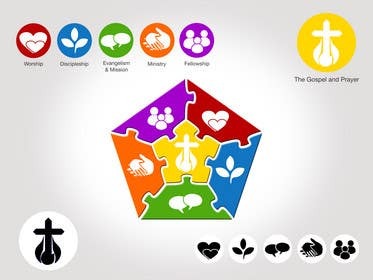 To get a better rating I would recommend looking for another representation of Ministry, and preferably an icon for discipleship that demonstrates growth or following, rather than a preacher. I'd also look for a colour scheme that is either brighter or with a sense of friendliness. I have submitted #45 and #46 . I have changed the discipleship and Ministry and also changed the colors. Please have a look and give me your feed back. I will have an opportunity to share these designs with a team mate tomorrow (18 hours from this posting), so if you have any ideas that you would like critiqued, please put them up so he can see them. We'll offer feedback to every entrant. We are working out whether to go for the vibrant colours or the softer pallette at the moment (but probably prefer the latter). We like yellow in the centre. I've sent you some further feedback on your private message board. 40 is really nice...instead of the letters why dont you put the icons across the red band....just a thought. No 43 is the guiding star, the center of which is the church through which the rest follow. personally i would like to keep it a single color but since you wanted an option of colorful eye-catching, i've added some colors. Again not finished just to see whether it works conceptually. Hello Mr. Lloyd , these designs are definitely not finished just posted out to see how you liked the concepts. No 44 is the cross which shows the messages of community, prayer and worship. Because the message is serious in nature i have avoided a colorful display. .... A cross with the logo could also be a great pendant for patrons and publicity for the church so also fridge magnets . I want to layout a design, can you wait for it before you decide? I did a whole new feel to the layout see #38 & #39. Constructive feedback welcomed. Thank you. #36 has a lower ranking only because I felt the Gospel & Prayer icon was weaker than the one in #37 . Perhaps an open bible (no crosses) with a flame BEHIND, rather than a candle over the top? Ok thanks i will submit with changes soon. A few designs are showing "discipleship" as a preacher or someone at a lectern. This is an image we would prefer to avoid, as we believe that growth can come about in many ways, not just from the preacher. Just an update after discussing the entries so far with a colleague. We feel that almost all of the current designs look very cluttered. A suggestion at the moment is to perhaps keep the icons separate from the main image for clarity, and submit the icons in their own image. Also, try not to crowd the icons (whilst the focus on the cross is nice, many of them are cluttering up the space). I love work for church. Good day! I am not designer. Seeking a position as a reliable coder to improve my performance by employing the best quality data & coding skills possible. A position that will fully contribute my knowledge and skills for the improvement of the website. With my experience as a coder for 4 years, I believe that I have the correct skills and attitude to fulfill my role within your web development team. Contact me to get samples of my work and SEO report (invitations, address, data entry) for christian schools assotiation web site. Thanks. Hello, thanks for dropping by! At this stage we have only just got the shell of our church's website off the ground, and it isn't fully launched. Unfortunately we don't need the services of a coder at the moment, but thanks for offering. Whilst I personally like the web concept that you have included, I have just come out of a discussion with a teammate where the feeling was that we needed a crisp, clear image without too much clutter. Conceptually, what you've given us is fantastic, but a bit too "busy" for the ways we would want to use it. I would be interested to see how this design looks just removing the purple lines, though if you could try that? have submitted one as a test...don't see it on the panel any reason? Ansh, I can see yours. It's #22. Consider your test successful! I'm interested to see what original ideas you can present. @adhoc.....like i said it was only a test ...the original ones follow!! Thanx Lloyd for you feedback. Its 21 and NOT 22 !!! Sorry :( !!! Thanks, and also thank you for getting it in for the discussion. I think your layout is original, and I am pleased to see you thinking outside the box. However, my teammate and I both felt that design #21 was very difficult to interpret in terms of how it is arranged. Although many of the other designs submitted so far have similar layouts, they help to reinforce the notion that each element is in balance. Perhaps you could come up with a way of showing them as even with one another? Yes, #8 is a great idea. I would be interested to know how it would look if the icons were all vertical. And whether it would look better or worse if it is shaped as a pentagon, rather than a circle. I like your thinking so far. Thank you vary much.I will do my best.